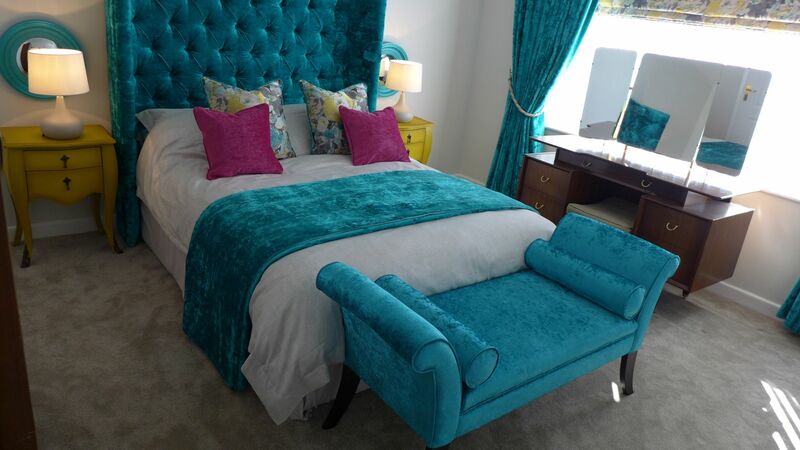 We created this boutique bedroom design to give our client a sense of hotel style luxury in her dated apartment. 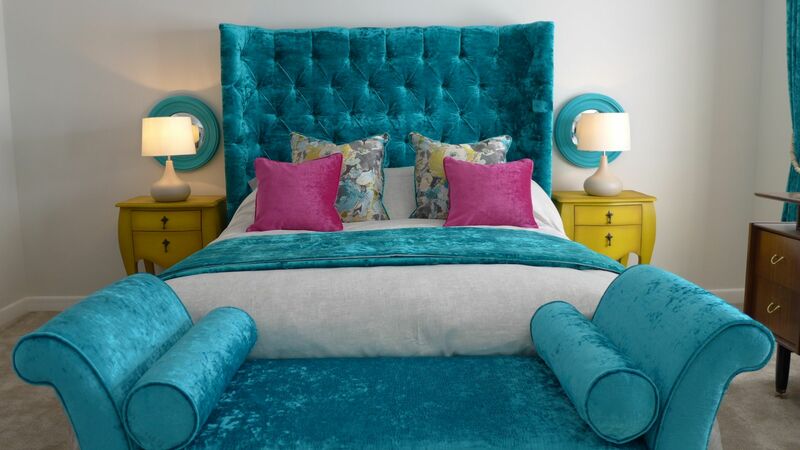 Having purchased the flat in the 70s, our client had lived with her 50s bedroom furniture ever since. She asked us to come up with a design to lift the space. 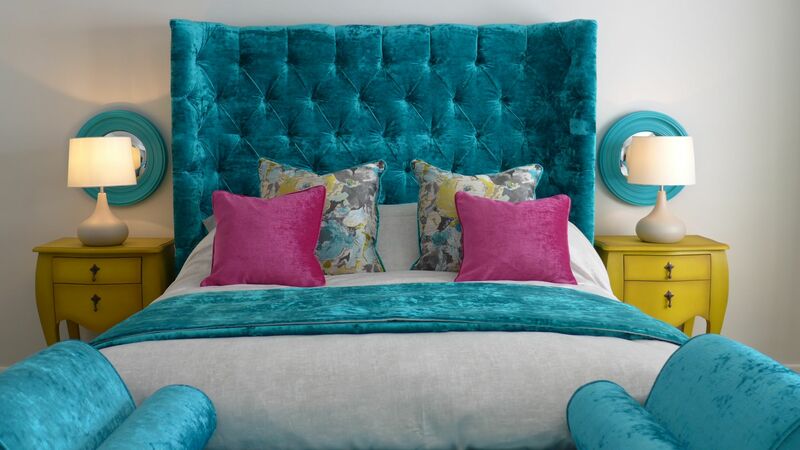 You usually associate a boutique bedroom design with a trendy hotel chic style. But you can have that in your home too. It just takes a bit of research and hunting through high quality fabrics and finishes to find a combination that works. 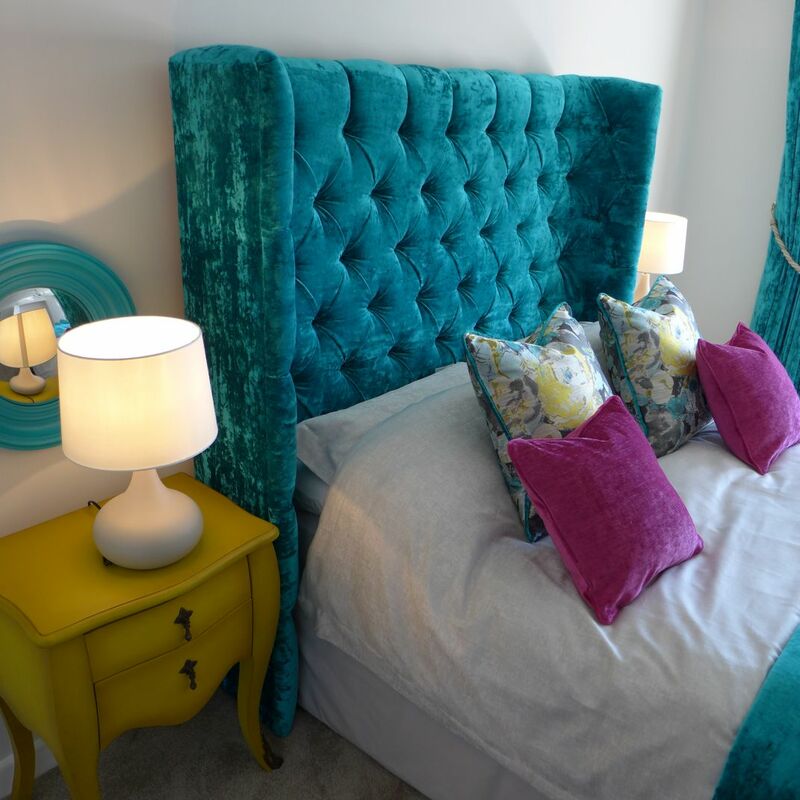 You still need to do the basics first, and that is to plan the bedroom to scale with furniture and fittings, then compose your sample board to inspire the decor. 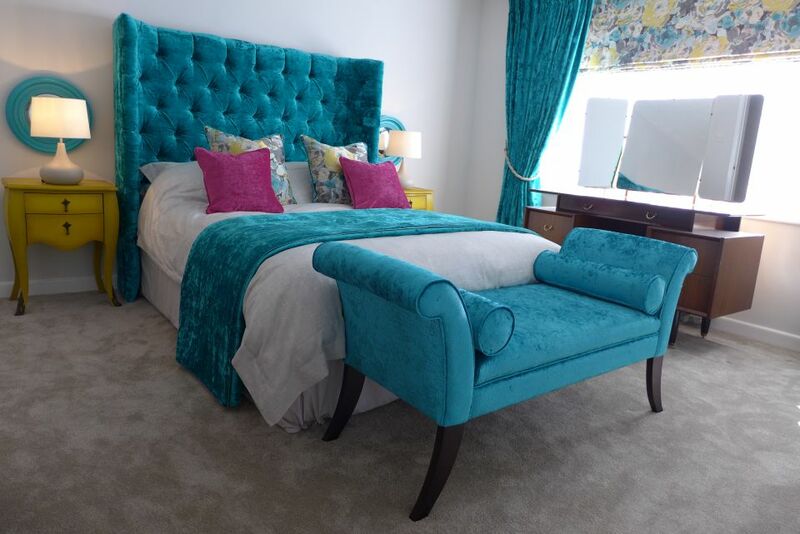 Having laid out the bedroom floorplan and introduced new sockets for bedside lighting, our client asked us to retain some of the old furniture for the time being. So we focused on the curtains, blinds, headboard, chaise, carpet and decoration. We produced 6 decorative options and together we narrowed it down to 2; one pink-based and one teal-based. Adding more detail with specific samples in these colourways, our client favoured the teal-based design and we finalised the sample board. 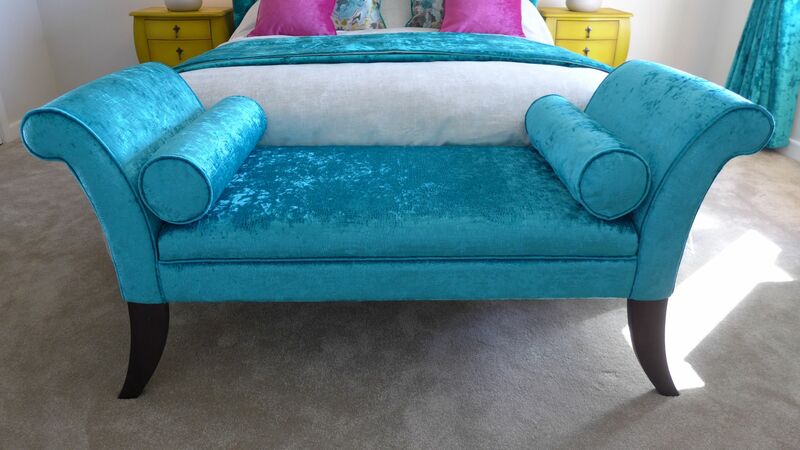 We further refined specific furniture designs with our trusted fabricators. 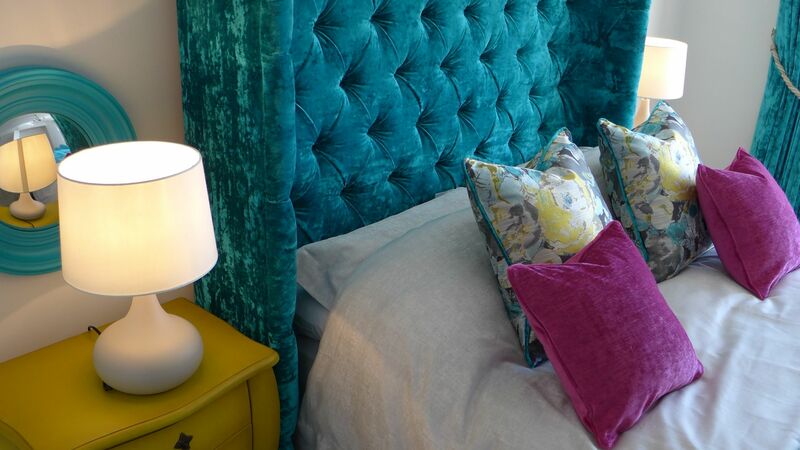 We detailed the deep-buttoned headboard, with cushions from the roman blind fabric and piped in the curtain fabric. At one point our fabric supplier reported that the velvet was out of stock, but they worked quickly to find a quantity which they diverted for our order. 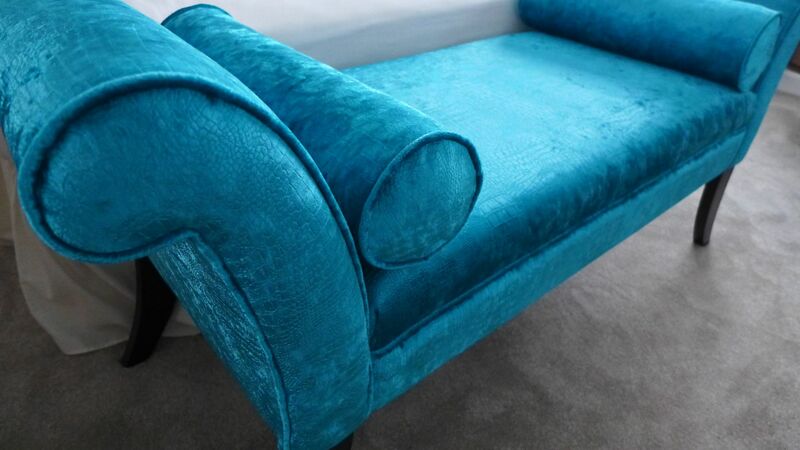 The chaise is upholstered in this fantastic, vibrant blue velvet crocodile design. Our client needs touch-sensitive table lamps to save her from having to operate switches. We found these stylish models which toned well with the wall and other colours. 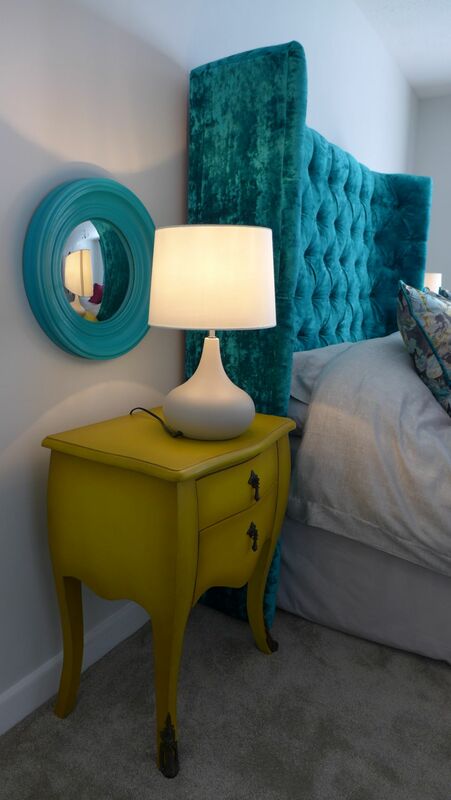 We also identified some fantastic sunset yellow bombé bedside units – the only new storage furniture for this phase of the scheme. They pick out the yellow in the roman blind and unify the scheme across the bedroom. 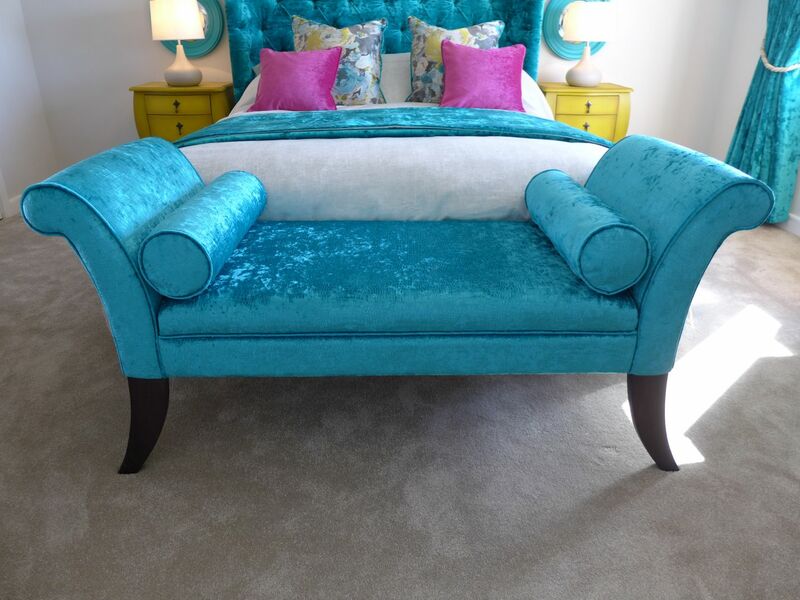 A luxurious Cormar carpet gives a luscious feel underfoot, providing the neutral canvas; marine and teal coloured velvets then punch through. 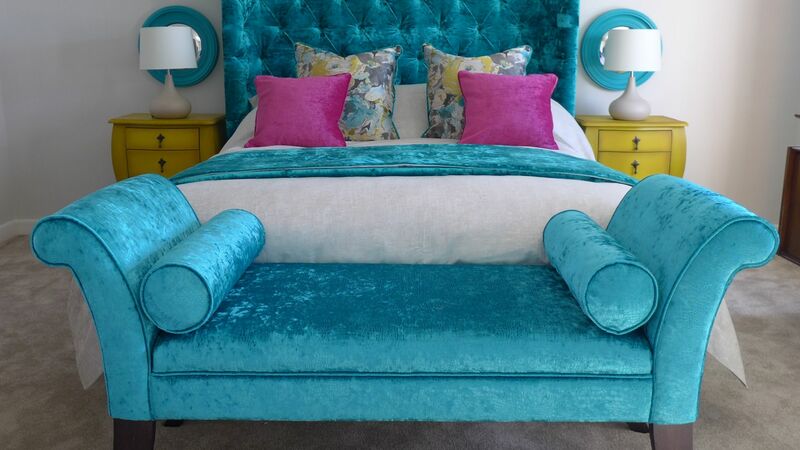 We often add a further strong accent to our schemes; in this case the fuchsia pink cushions. The round concave mirrors were an internet find which we painted marine blue; set behind the side lamps they reflect light and provide extra interest for the room. 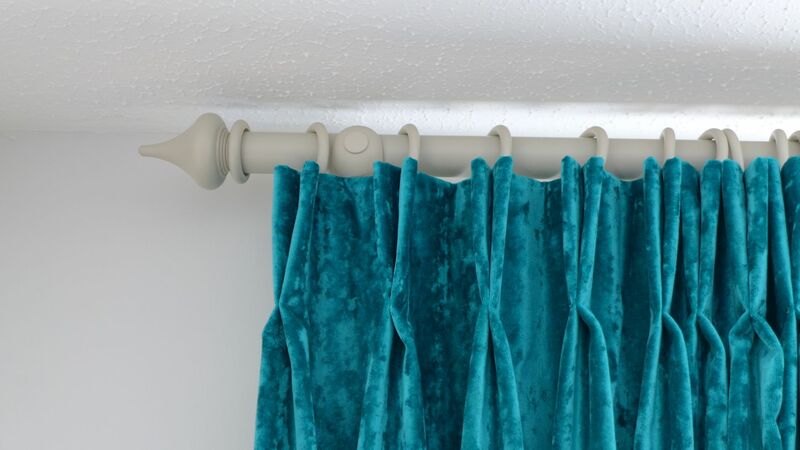 We spotted the roman blind fabric on a trip to Chelsea Harbour and teamed this with the luxury velvet curtains and bed runner. 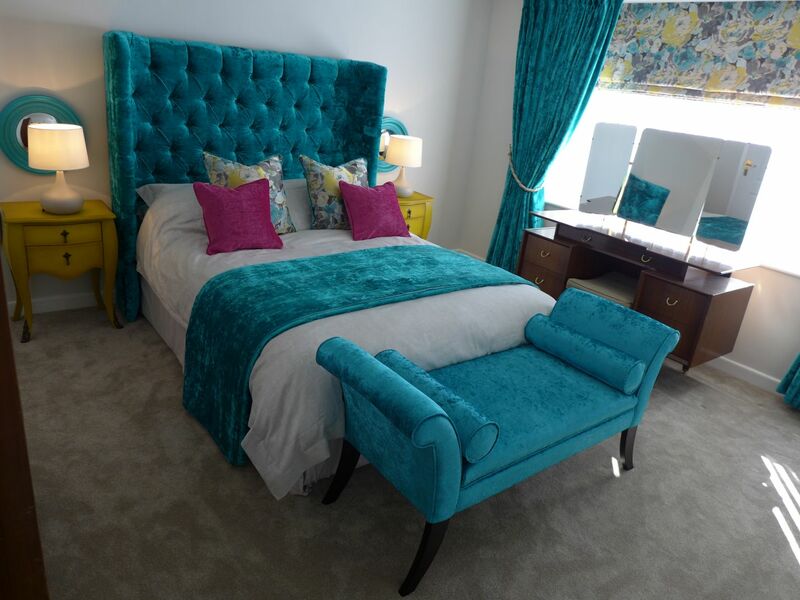 Of course we are indebted to our client for this opportunity to create this boutique bedroom design. First and foremost, it needed to meet her brief. She was confident in our design to indulge the fabrics, colours and special furniture that form this dramatic, hotel style bedroom. 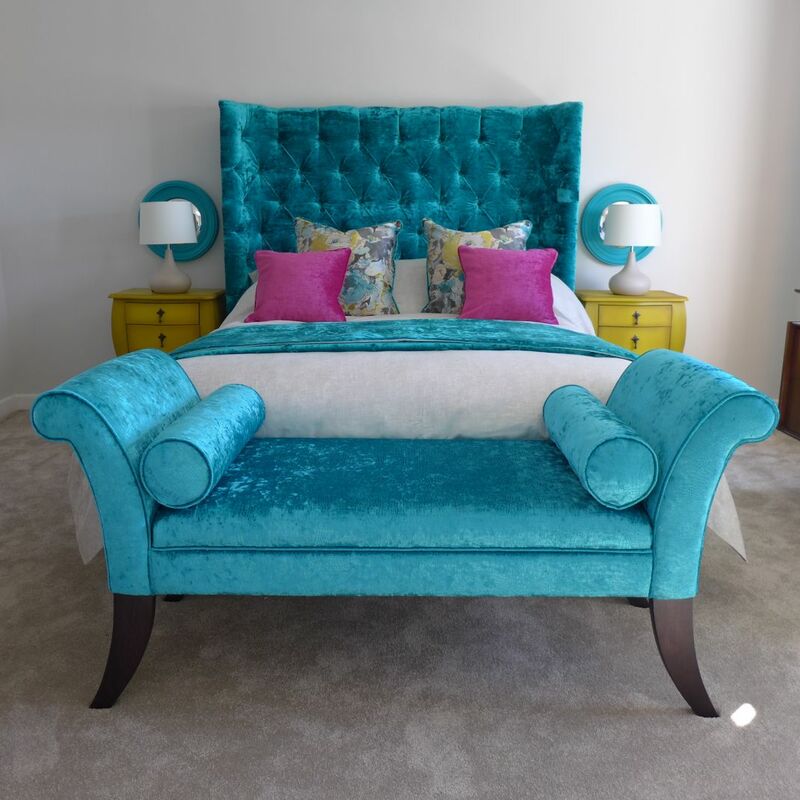 Perhaps you have bedroom in need of refurbishment; if you are interested in seeing how we can help in Bath or Bristol please read more about our interior design and home renovation service.